The clocks went forward last weekend, and it’s a perfect reminder that summer is on the way. Also, it’s time for spring cleaning! Donating or recycling stuff you don’t need, getting rid of clutter and giving cupboards a clear out can be weirdly satisfying. 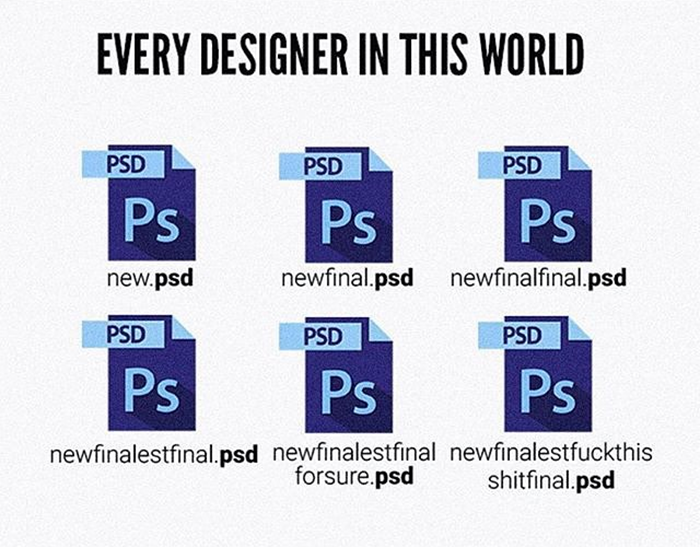 Anyway, if you’re a designer, you have probably encountered this at one point in your career. So while we make jokes about not labeling folders, files or layers within a work document correctly, but the truth is that we should always try to organise design work correctly. Typically, the final few days or weeks of any project are pretty ‘scrappy’. Last minute changes to the design are implemented based on unforeseen technical constraints, and adjustments and compromises impact the design. This has occurred in every project I have worked on, so I would assume that it’s pretty normal. When I worked in an agency, projects would overlap to an extent. The final touches would be happening on one project, while the initial designs were being created for the next one. Designers didn’t have the luxury of down time in order to organise their work, they were just expected to do it along the way. An organisation isn’t going to ask you to make time to organise your design work. Managers (particularly those that don’t have backgrounds in designer) have – at least in my experience – expected the designers to have a system for staying organised. If you don’t have a system in your company, it’s up to you to create one. With the chaos that comes with the last few weeks of a big project, organisation is an easy thing to set aside in favour of getting the project done on time. We’ve all been there. Organising design files takes time and discipline, but in the grand scheme of things, when deliverables are more important, why spend your time doing it at all? If something happens and you need to suddenly leave the office for a few weeks, the other designers on your team might need to find something. If you move to a different company or a different team, the new designer may need to find the files you were working on. You will spend less time searching through folders for an old file if someone asks for it. It will give you a sense of control and order across not just your design work, but inspire the same with other designers on the team. Within each client folder, there might be different projects that you are working on at different times. This could be a revised navigation, or a new feature. Clearly name the different projects. Put aside 1 hour at the end of every week to clean up your design files and organise everything. If you don’t have a shared drive to organise, spend time tidying up your active Sketch or Photoshop files, or even the files that build up on your desktop. Get into the habit of structuring your digital workspace. If you don’t already have a good system for sharing the teams design work across your internal network, set one up. Create a proposal for how to structure design files over the internal network, and get the other designers to support it. Having consistency across the team will also make it easier for others to find what they need, if someone needs to take unexpected leave. There is no way to predict the number of iterations a design project will get, so use numbers to differentiate the files until you realise your final version. So here’s the final part of the puzzle – get rid of any files you don’t need. Designers go through dozens of iterations, and most of them are just discovering the right approach. In my experience, I have never needed to go back and present iterations after a project has been implemented. If you want to hang on to a few iterations in case, that’s up to you – but go through the unnecessary files and tidy them up. Keep the shared drive free of clutter to make the necessary files easier to find. That’s all you need to do – start thinking strategically about how to store work, and make sure the work that is stored is easily shared between the team and with future colleagues. My file system isn’t perfect, but I advise you to find a system that works for your workplace, and will hopefully inspire you to get started.